Brothers Moving moved us two flights down to where we live--the American-sized washing machine was IMPOSSIBLE -- they hauled it down to ground floor and back up through a large window. They did it. Everything they did was done perfectly. We're asking them to move us again, after only a year, as the owner has to sell. (We thought we'd be here forever.) We wouldn't consider asking anyone else. These are pros and good-natured mentchen. I moved within the street I already lived in, and on the basis of a personal recommendation, I chose Brothers Moving. They gave me a very fair estimate and did not try to charge me more. I was very impressed by their skill and professionalism. I would certainly use them again. I give you my wholehearted recommendation to use Brothers Moving for your next move. We've used these guys for a few small moves, and this is the first time we've used them to move our whole apartment. They came exactly on time and they were really great. We were really busy before the move, so we asked them to pack up the rest. They packed very well. We used Jake and "Brothers" for an office relocation. Very professional. Arrived on time. Overall pleasant experience with fair prices. I used them today (September 11th) to transfer some household items from jerusalem to Beersheva. Despite them having the difficuclt task to disassemble two wardrobes and reassemble them, they did a great job. All the rest of the things - double bed, kitchen table and chairs etc - were done professionally. Jake and his movers were professional, receptive, efficient, reliable and fairly priced. Along with all this they were honest and trustworthy - handing over an envelope of money that was found while packing up the closet. I would use them again and would highly recommend them. The Hardest-Trying Movers of All! There is no perfect company - but I'm sure that Brothers Moving try the hardest of all of them. They are always trying to make the customer happy and have a great balance between professionalism and flexibility. You can trust these guys with your life, let along your valuables :) Every worker seems 100% honest and sincere, and they make the process a whole lot easier. We recently moved into a new flat with the assistance of Yonah from Brothers Moving. Due to the All- Mighty's greatness I literally had less then a week to pack up our apartment, get it picked up and put in storage... Jake calmy came in with his team and efficiency took care of everything... No excuses, haggling or drama B'H! There is nothing better then being able to work with good people, except to wok with good people that do a great job. 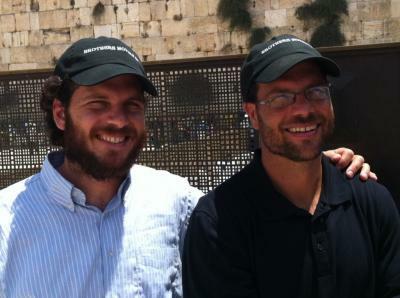 Jake and Yona moved our entire house from Bat Ayin to Jerusalem - it was a wonderful experience from start to finish. They were on time, and finished ahead of schedule. They were very tidy and careful with our belongings, and a pleasure to deal with in general. Highly recommended! They showed up over 3 hours late. Took them 9 hours to move my 2 1/2 room apt. They broke most of my furniture. They couldn't manage to get my refrigerator into the apt., so they left it in the garden downstairs. Nightmare, really. Spoke to them a few times afterward and they told me my stuff was old and I couldn't prove they'd broken it. I helped my friend move and he used Brothers Moving. They were amazing. Very helpful, careful with everything and dedicated to the job. I have used Brothers Moving Co. 2 times now, and in my last move these's guys were amazing. My apartment has a very narrow entrance, it looked like an impossible job to get everything moved in but they did it. My bed was a different story, there was no way that it was going to fit though the front door, Jake and Johna worked late into the night and ended up having to hoisted the bed up to the second floor though my balcony, it was amazing they didn't stop until the job was done. If your looking not only for the best but the greatest, call Brothers Moving Co. you'll be so,so happy you did. Jonah was great to work with. On short notice we needed to move our family of nine. We were given different leads about moving companies in the Jerusalem area. Friends of ours recommended Jonah and Jake. We had also considered renting a van through Avis. In the end just Jonah came with a large truck and our entire family participated in the move. My Husband and children lifted and loaded the truck alongside Jonah. It was a creative interactive moving experience and Jonah was able to go with the flow. It went much smoother than I had ever anticipated. Jonah is a real Mench. He had patience enough for that moving day anxiety. We would definitely use them again in the future. I had to move a very heavy piano to my new house. It was not an easy move because my appartment was on a small alley in Nachlaot. Jake and Yonah gave me a professional service at a competitive price, I highly recommend them! We used them a few month ago. They did a great job !! They did not suddenly add more money like other movers do saying "o we didn't see this" - very honest people ! They made the move so much easier and work with a smile !! Jake and Yonah are really awesome movers. I can't imagine using anyone else for a move. I have known Jake since we came to Jerusalem 4 years ago and were in a holiday rental. When we needed to move to our permanent flat, he only had a van but he got us there on Erev Rosh Hashana with ease. Later when we moved to Teveria, we only thought to call them and again from Teveria to Hadera. We're now moving to Netanya and while this will cost us more than a local guy and even tho we don't have precious heirlooms to move, we wouldn't think of calling anyone else except The Brothers. They're almost like family! I want to highly recommend the Brothers Movers Company. We just completed a move with them last night and they were everything one looks for in a moving company: professional, efficient, extremely pleasant and a pleasure to work with. Thanks to Jake, Yonah and Eliyahu you were terrific!!! As a eral estate agent I am often looking for related tradespeople that complement my service. For in and out of the country its Sonego and within the land its the Lessards! Very professional and kind. Great service. Reasonable rates. Would definitely use again! We have moved a number of times. We moved with some of the biggest names in the business and had terrible moves. When we moved with Jake and Yonah it was amazing. 5 stars!!! We moved from the north of the country to Jerusalem and were very pleased with professional way they moved everything, Nothing got damaged or broken in the move. We've used Brothers Moving Company 3 times -- including one very difficult move to a 4th floor apartment without an elevator -- and have been very satisfied every time. Definitely, definitely use them if you can. 100% jewish work. Great service. Great prices. On time and reliable. I can higly recommend their service! I can highly recommend the Service of HOVELOT ACHIM BROTHERS MOVING COMPANY. Jake helped me to move on 2/12/09 and he did an exellent job, he is profesional and very responsible...he is also very much inexpensive..